Top Up allows you to buy Amazon products without needing a bank card. Amazon is looking to make it easier than ever for UK shoppers to buy goods on the site using their mobile devices. 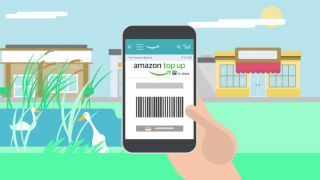 The company has this week launched Top Up, a new service that lets users deposit money into their Amazon account simply by scanning a barcode with their phone. Users will need to be at a participating retailer to access Top Up, which Amazon says is aimed at helping the small amount of shoppers without debit or credit cards to use cash to buy goods or media content online. Top Up is launching in partnership with British payment firm PayPoint, which is a familiar sight at corner shops, petrol stations and supermarkets with its bill-paying service. Once users have set up an account on Amazon's mobile app or website, they can then take this to a merchant with a PayPoint outlet. Once scanned, users can add between £5 and £250 to their account, which will then be added to their Amazon Gift Card balance, and used to buy goods on Amazon's web and mobile platforms. There are no fees associated with using Top Up, and the bar code can even be printed out if users don't like carrying a mobile device around. Amazon Top Up appears to be a rebranded version of the company's Amazon Cash service, which launched in the US back in July, and aimed to target the seven per cent of US households without access to bank cards.